Wiley Post waving to the crowd before taking off to make the first solo flight around the world. 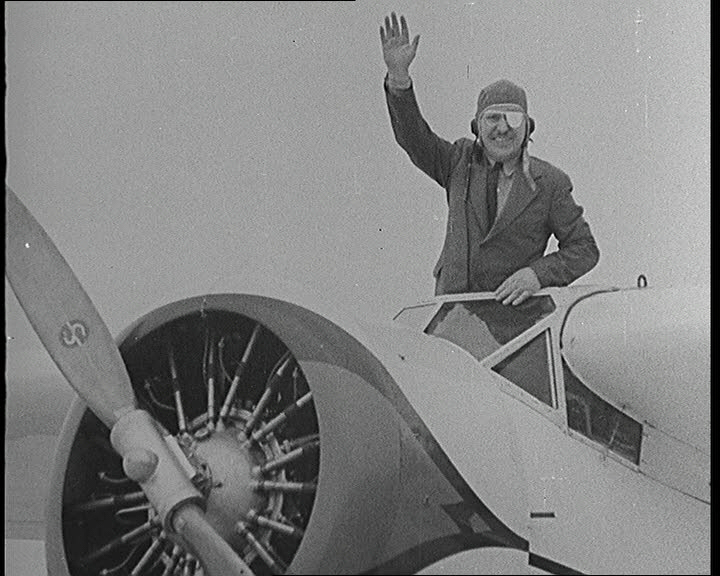 As he waved, he said “So long, see you in about six days!” Credit: Still taken from British Pathé newsreel 1933. On July 22, 1933, Wiley Post completed the first solo flight around the world. Wiley Post was already famous for setting a speed record for flying around the world with his co-pilot Harold Gatty two years prior. The two men flew the 15,474 round trip in the Winnie Mae, a Lockheed 5-C, in 8 days 15 hours and 51 minutes. When they landed at Roosevelt FIeld in New York, they were treated to lunch at the White House and a ticker tape parade in New York City. Post wanted to open his own flying school, but had trouble finding funding. People with money in the 1930s were hesitant to give money to a rural pilot with no formal education, even if he is a world famous pilot. Post felt he had to one-up himself. He would break his record and do it alone. He added a new autopilot device and a radio compass to the Winnie Mae and set off from Bennett Field in New York on July 15, 1933. During the first leg of his journey, he encountered foul weather. In spite of this, he set a new record time flying New-York to Berlin in just 26 hours. He left Berlin to cross the Soviet Union to Khabarovsk. After a quick stop at Königsberg to pick up some maps, his autopilot began to have difficulties. He had to make an unscheduled landings in Moscow, Novosibirsk and Irkutsk to tinker with his autopilot. Even with all these stops, he made Khabarovsk 10 hours ahead of his previous time. After leaving to cross the Bering Sea for the Alaska run, his radio compass stopped working. He had to follow the coastline until he spotted terrain he was familiar with. He landed in the small mining town of Flat, Alaska and badly damaged his plane during landing. A crosswind flipped the plane onto its nose, bent the landing gear and broke the propeller. A new propeller was flown in from Fairbanks while the miners helped right the plane and repair the landing gear. Once the Winnie Mae was operational, he continued to Edmonton, Canada. He flew non-stop from Edmonton to New York to finish his trip. Post was met by 50,000 fans when he touched down again at Bennett Field. Even though he had all these problems, he beat his previous record. The trip took 7 days 18 hours and 49 minutes. This was 21 hours faster than the previous trip. Not too bad for a one-eyed Oklahoma boy.